RACINE, Ohio — After a classic battle, the Tornadoes were able to celebrate football’s equivalent to a walk-off home run. Southern claimed a 27-21 victory over Tri-Valley Conference Hocking Division guest Wahama on the final play of the game on Friday night at Roger Lee Adams Memorial Field in Meigs County, as SHS senior Riley Roush ran for a two-yard touchdown in the second overtime period. Southern (3-0, 1-0 TVC Hocking) — which never trailed in the contest — forced Wahama (0-3, 0-2) to punt on the game’s opening drive, after one WHS first down. 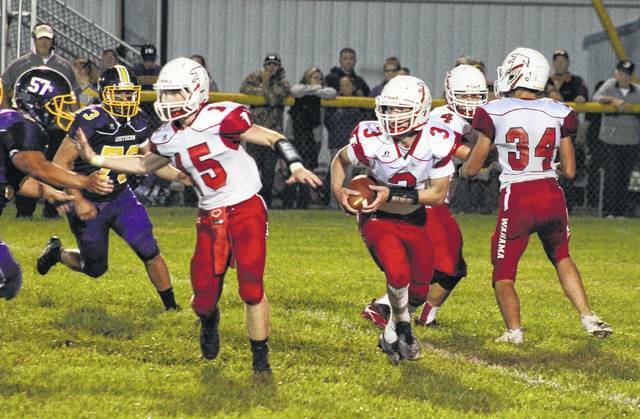 The Tornadoes took possession at their own 32-yard line and methodically marched down the field. On the 13th play drive, Roush scored his first of four touchdowns, with a two-yard rush. Andrew Evans kicked the extra point, giving SHS a 7-0 lead with 4:41 left in the first. The White Falcons answered on the ensuing possession, covering 52 yards in five plays, aided by a personal foul against the hosts. The quick drive was capped off by a three-yard Christian Thomas touchdown run and a Christopher Hesson point-after kick, tying the game a 7-7 with 3:16 left in the first. Southern’s next possession lasted into the second quarter, as the Purple and Gold covered 70 yards in 13 plays. Again on the 13th play of the drive, Roush found paydirt, this time on a one-yard run. Evans made the extra point kick, giving SHS a 14-7 lead with 9:19 left in the first half. After a WHS three-and-out, SHS took over at its own 40. The Tornadoes went to the air on four straight plays, moving inside White Falcon territory. On a first-and-10 from the 36, Roush broke free for his third touchdown run, a carry that turned out to be the longest play from scrimmage in the game. Evans kicked in the extra point, giving SHS a 21-7 lead with 5:07 left in the second quarter. Wahama opened the next drive with its longest play of the night, a 26-yard run by Thomas. WHS converted on one fourth down in Tornado territory, but turned the ball over on downs following three incompletions over the span of four plays. Southern ran out the first half clock, taking a 21-7 lead into the break. The Purple and Gold started the second half with the ball and, after not punting once before halftime, were forced to punt after just three plays. A flock of White Falcons found their way into the backfield, blocking the punt and giving WHS possession in the red zone. The Red and White needed just five plays to cover the 18 yards in front of them, with Thomas delivering a six-yard run for the touchdown Hesson added the extra point, cutting the Wahama deficit to just seven points with 7:41 left in the third. Southern advance the ball to within one yard of the goal line on its next drive, but a fumble led to a backwards play, which was followed by two incompletions and a loss of downs. The White Falcons took over at their own 13-yard line with 3:10 left in the third quarter. Nearly Seven minutes, 16 plays, and 87 yards later, Thomas was in the endzone for the third time in the game on a one-yard run. Hesson split the uprights on the extra point, tying the game at 21 with 8:17 left in regulation. Southern found itself in the red zone after six plays on the ensuing drive, but a holding penalty stalled the drive and SHS turned the ball over on downs. After a three-and-out by both teams, Wahama was content to run the clock out and head for overtime. With both teams getting an opportunity from the other team’s 20-yard line in overtime, Southern took possession first. The Tornadoes failed to gain a first down after four plays and it was Wahama’s turn. The White Falcons’ first overtime opportunity was ended on an unsuccessful 35-yard field goal attempt. Wahama got the ball first in the second overtime, but went backwards before losing possession on downs. Roush broke an eight-yard run to start Southern’s second overtime possession. Following the play, Wahama was penalized for a personal foul, moving the ball to the WHS six. From there, Dylan Smith moved the ball four yards on a first down run, setting up the game-winning play. Roush carried the ball on a sweep to the left, outran a WHS defender and found the endzone for six points and the 27-21 win. “I’m very proud of our kids, they hung in there and gave great effort,” Southern head coach Mike Chancey said. “We knew it was going to be a different football game than we had in Week 1 or Week 2, and also a different game than it was a year ago. Coach Barr is a good football coach and I knew he was going to have those kids from Wahama ready to play. For the game, Southern outgained the White Falcons by a 327-to-209 clip, including 209-to-180 on the ground. SHS held an overall 20-to-13 advantage in first downs, with a 14-to-6 edge in first downs before halftime. Both teams were penalized seven times, SHS for 70 yards and WHS for 61. The Tornadoes fumbled twice and the White Falcons fumbled once, but neither team lost possession. “I give a lot of credit to Mike Chancey and his staff, they do a heck of a job, its a great coaching staff,” said Wahama head coach Dave Barr. “At halftime we made a few minor adjustments to what we were doing defensively and we challenged the kids to go out and play football the way that we know they’re capable of playing. The Tornado offensive attack was spear-headed by Roush, who carried the ball 29 times for a total of 132 yards and four touchdowns. Dylan Smith — who completed one eight-yard pass — gained 67 yards on his own, combining 17 carries with a pair of receptions. 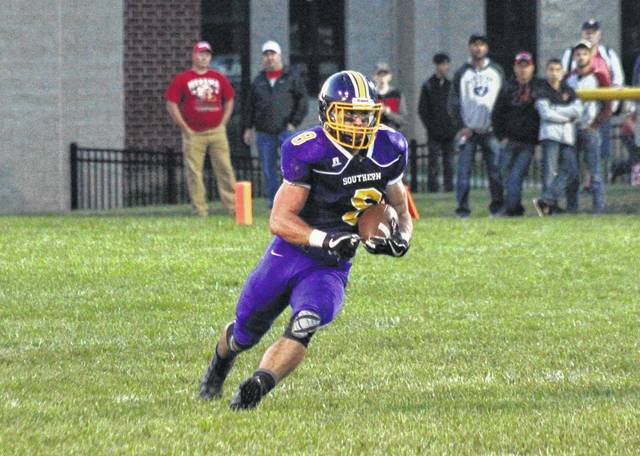 SHS junior Logan Drummer was 8-of-18 passing for 110 yards, while carrying the ball five times for 25 yards. Brody Dutton caught a team-best three passes for 30 yards, Austin Baker had 37 yards on a pair of receptions, while Gage Shuler had a 28-yard catch and Garrett Wolfe had an eight-yard grab. The White Falcon offense was led by Thomas, who ran 26 times for a total of 117 yards and three scores. Colton Arrington had 63 total yards, combining 12 carries and one reception, Ronin Madill added five yards on a pair of rushes, while Jacob Warth had a team-high three receptions for 24 yards. WHS quarterback Bryton Grate was 4-of-10 passing for 29 yards, while adding two yards on the ground. Southern — winners of three straight over Wahama — has now won five regular season games in a row and will look to make it six on Friday at Miller. The White Falcons will try to snap their eight-game skid at Belpre on Friday. 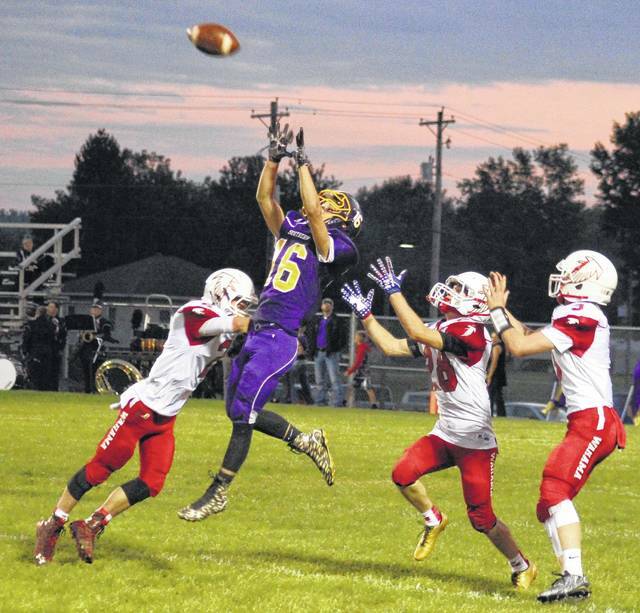 Southern senior Riley Roush (8) runs in space during the first half of the Tornadoes’ 27-21 double-overtime win over Wahama on Friday in Racine, Ohio. 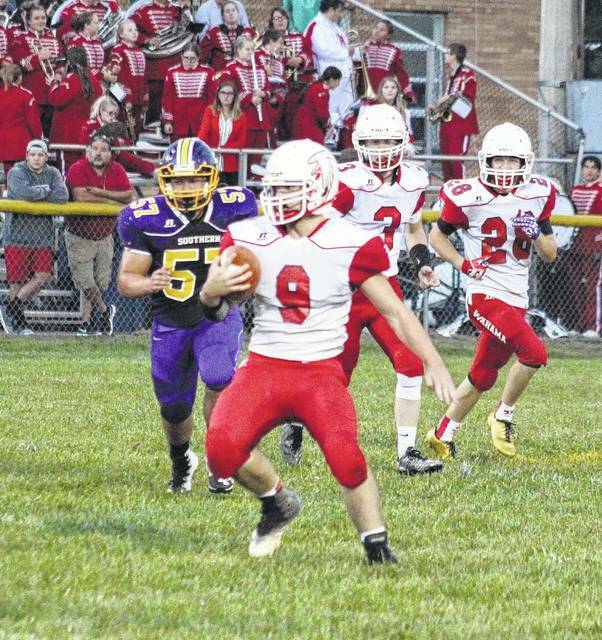 Wahama junior Ronin Madill (9) runs for yardage in front of teammates Bryton Grate (3) and Colton Arrington (28) as well as Southern’s Matthios Stansberry (57), during the first half of the Tornadoes’ 27-21 double-overtime win on Friday in Racine, Ohio.